It is the season for all things pumpkin and I love pumpkin bread. But this morning I also had some sorry looking bananas that needed immediate attention. Which got me to thinking, why not banana pumpkin bread? 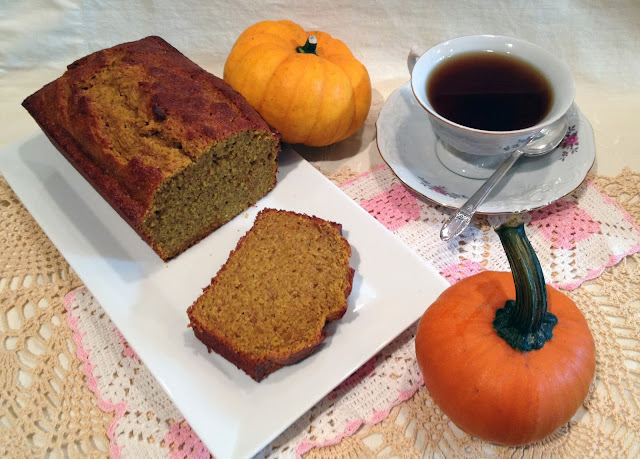 I took out my banana bread recipe and my pumpkin bread recipe and created this banana pumpkin quick bread recipe. I was hoping it would turn out well but you never know when re-writing a recipe. It turned out wonderful! So here is the recipe. Enjoy! In a large mixing bowl add 1 & 1/4 cup of the flour along with the rest of the ingredients. Mix on slow until combined. Once combined, beat on high with electric mixer for 2 minutes. Add remaining flour, mix well. Pour batter into greased loaf pan (9x5x3 inches). Put in middle of oven and bake 1 hour plus 10 - 15 minutes (check at 1 hour but expect to need another 10 or 15 minutes). This is a very wet batter meaning it will take longer to bake than and average quick bread. Check doneness by inserting a tooth pick or wooden dowel into the center. If it comes out clean, the bread is done. Turn out onto a cooling rack immediately and let cool completely. For best results, wrap tightly and let sit overnight. But I can never wait that long! Oh my, this sounds delicious! I must give it a try. Yum! You have two eggs listed twice. Do you use 2 eggs, or 4 eggs? Thanks! Oh my thank you for catching that! Only 2 eggs. I have edited the recipe so it is correct now. Great combo!! Thanks for sharing on Wildcrafting Wednesday!